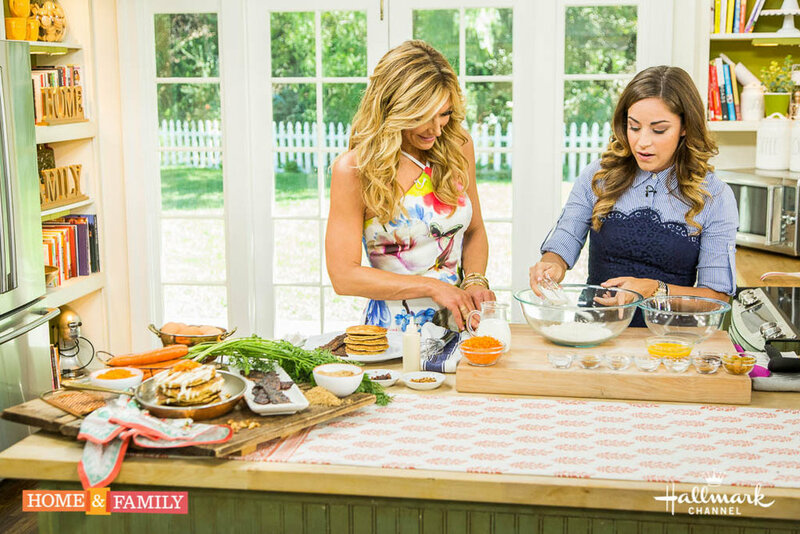 These carrot cake pancakes with cream cheese icing were what I introduced to the Hallmark Channel’s Home and Family audience. I am still thinking I am going to wake from this dream. I will forever be grateful for this opportunity. It is something I didn’t think I would get to do. Of course I think all of my family, friends, and DishItGirl supporters! I originally set out to get creative with my National Pancake Challenge in partnership with Hungry Jack and T-Fal Cookware. Little did I know I would be sharing this dish on national television! T-Fal is celebrating 60 years of producing innovative cookware. When I think of non-stick cookware I feel like it is synonymous with the T-fal brand. The Thermospot technology that is patent by T-fal is evident in this pan. At first I put butter in the pan but I quickly learned I didn’t even need to butter the pan. My pancakes did not stick to the pan without any help from butter or spray! I also loved that the pan was a total breeze to clean. There was no scrubbing and no residue to fight with. This will be my new go to pan, especially for pancakes! In a large bowl add together all of the dry ingredients. The pancake mix, sugar, cinnamon, ginger, and nutmeg. Mix together. In a medium size bowl combine the wet ingredients. Whisk together the eggs, milk, vanilla extract, and carrots. Heat a large non-stick pan or griddle over a low setting. . Otherwise grease the pan with a little bit of butter, clarified butter, or cooking spray if you have it. Take the pancake batter out of the fridge. Once the pan is warm use a 1/4 cup to pour the pancake batter into the pan one at a time. It doesn't have to be a full 1/4 cup just about that size. Sprinkle in the raisins as desired. When you see holes/bubbles start to form on the surface of the pancake that means its ready to flip. You want to make sure the pancakes are golden brown on each side. Whisk the cream cheese in a small bowl until it is uniformly soft and pliable, with no lumps. If your cream cheese is not soft enough yet to do this, try putting it in the microwave for just a few seconds at a time. Whisk in the brown sugar simple syrup, milk, lemon zest, and confectioners sugar. Add more milk if you want to thin out the mixture, add more confectioners sugar if you feel it needs to be smoother. Drizzle over the finished pancakes.